“Lifestyle medicine” is a relatively new field of integrative medicine that’s part of the preventive health and wellness movement. It holds that obesity and most chronic diseases (heart disease, diabetes, cancers, etc.) are due to bad lifestyles, namely bad diets and lack of exercise. These beliefs have become so widely promoted, that many consumers don’t realize the elements of fringe that have entered into mainstream, evidence-based medicine. The first meeting of the Australian Lifestyle Medicine Association was reported as taking place today and provides an opportunity to learn more about this field and those behind it. The new Lifestyle Medicine program for primary care practitioners has been just opened at Southern Cross University by Garry Egger MPH, Ph.D., MAPs, the Director of the Centre for Health Promotion and Research in Sydney and an Adjunct Professor in Lifestyle Medicine at Southern Cross University. Healthcare providers can receive a masters in lifestyle medicine through its 1.5 year online degree program costing $14,160. It is described as saying: "Graduates from the program may diversify their career opportunities into fields such as social marketing and the media, managing community health programs, clinical management of lifestyle related problems (e.g. diabetes control, weight control and obesity management), designing corporate health programs or facilitating health care strategies in developing nations. In particular, this course expands the income potential for practice nurses and those wishing to work as consultants in this expanding field." 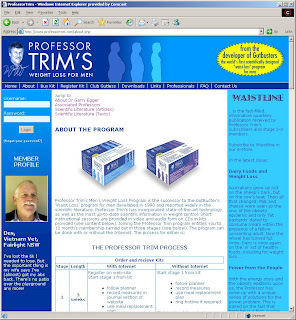 Professor Egger is known as Professor Trim and developed the GutBuster’s Waist Loss diet program for men which became his “Professor Trim’s Weight Loss Program.” It’s an internet diet using his Professor Trim meal replacements (chocolate or vanilla) and flavor powders (the 3-week quick start program is $495). He is also a board member of the Australian Association for the Study of Obesity (ASSO – the Obesity Society) and a government advisor and wrote the National Clinical Guidelines in Weight Control and Obesity Management and the National Physical Activity Guidelines for the National Health and Medical Research Council of Australia. He’s been part of the World Health Organization’s globesity pandemic initiatives that are based on dietary-behavioral policies. He created vector-based strategies for childhood “obesogenic” environmental interventions. The Australian Lifestyle Medicine Association was established by his department to bring doctors, “nutritionists, exercise scientists and physiotherapists, together to effectively deal with the alarming increase in diabetes, heart disease and a number of other lifestyle-associated illnesses,” according to the Northern Star. The ALMA website says it uses evidence-based resources and programs to support the delivery of lifestyle medicine by healthcare providers and help patients with their active self management. But no course curriculums are revealed, even for registrants. The courses for GPs and nurses only note they are sponsored by Pfizer pharmaceuticals and MBF (an insurance company offering corporate wellness programs, with member healthy lifestyle management, and weight loss programs). The university’s Lifestyle Medicine program says it is based on their recently published book, Lifestyle Medicine. Professor Egger co-authored it with Dr. Andrew Binns, a general practitioner in Lismor, and another Adjunct Professor at Southern Cross University. They’d also co-authored another diet book, The Experts’ Weight Loss Guide. The third author of Lifestyle Medicine is Dr. Stephan Rossner M.D., Ph.D., professor of health behavior research at the Karolinska institute in Stockholm, Sweden and director of the Obesity Unit at the Karolinska University Hospital, Huddinge Stockholm. He’s been the Secretary, Vice President and President of the International Association for the Study of Obesity (IASO), chair of the International Obesity Task Force’s (IOTF) communications group, and key organizer of a number of WHO globesity initiatives. Dr. Rossner is also a media personality and was a lead investigator on the RIO-Europe trial of acomplia (rimonabant) sponsored by Sanofi-Aventis and trial of Xenical for Hoffmann-La Roche Ltd.
Yeah, we don't have any evidence and it's difficult to set up a trial on this but logic would dictate that if you reduce the amount of non-renewable fuel being used then you're increasing the amount of personal energy... if you are a frugal user you can then save money by selling your carbon units back to the carbon bank... A carbon card wouldn't be any different to a credit card and in fact the English looked at the prospects for fraud with such a card and found that it is no greater than Carbon fraud... it all make[s] sense. If you don’t walk or ride your bike sufficiently, you’ll find yourself without heat or electricity or fuel for your car and, supposedly, fat. It’s all based on the myth that the natural diversity of sizes is due to diet and behavior and “everybody knows” that fat people eat too much and are sloths. There have always been diet doctors proposing all manner of unproven diets and weight loss programs. More surprising is that today, they’re taken seriously and serving as advisors to international governments and developing public health policies.